4 Civilians, including 2 children and international activist, were wounded in the West Bank and Gaza Strip. Israeli forces conducted 68 incursions into Palestinian communities in the West Bank and 5 similar incursions in Jerusalem. 44 civilians, including 12 children and 2 women, were arrested. 12 of them, including 6 children, were arrested in Jerusalem and its suburbs. Israeli authorities continue to make a Jewish majority in occupied East Jerusalem. A house in Beit Hanina was demolished, and another civilian was forced to self-demolish his house in Um Touba village. 8 civilians’ cars were confiscated from Beit Xa village while construction materials and fuels were entered only in coordination with the civil adminsrtation. A barrack used for ferrous metals was demolished in Hebron. Settlers attacked Palestinian farmers and shepherds, east of Yata, south of Hebron. Israeli forces continued to target the Palestinian fishermen in the Gaza Strip Sea. 3 shooting incidents targeting the Palestinian fishing boats occurred in the Northern Gaza Strip, but no casualties were reported. 5 Palestinian civilians, including 2 children, were arrested at the checkpoints in the West Bank. Israeli violations of international law and international humanitarian law in the oPt continued during the reporting period (23 – 28 November 2017). 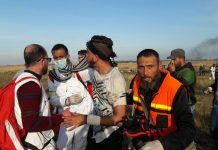 During the reporting period, Israeli forces wounded 2 Palestinian civilians, including a child, and an interntional activist in the West Bank while wounded a child in the Gaza Strip. In the Gaze Strip, They also continued to chase Palestinian fishermen in the Sea. In the West Bank, on 24 November 2017, A German activist was wounded with a bullet to the right side of his back while participating in Ni’lin weekly protest, west of Ramallah. On 26 November 2017, 2 Palestinian civilians, including a child, were wounded when Israeli forces opened fire at dozens of students in al-‘Aroub refugee camp, north of Hebron, as the latter organized a peaceful protest in commemoration of the killing of child Khalid al-Jawabrah near the bypass road in the civinty of the refugee camp. In the same context, Israeli forces continued to use force against the protests organized by Palestinian civilians and international human rights defenders against the annexation wall, confiscation of lands and crimes of settlement expansion. During the reporting period, dozens of Palestinian civilians, international human rights defenders and Israelis organized protests in Ni’lin and Bil’in villages, west of Ramallah, al-Nabi Saleh village, northwest of the city, and Kafer Qadoum village, northeast of Qalqiliyah, in protest against the annexation wall and settlement activities. Israeli forces forcibly dispersed the protests. As a result, many of the protesters suffered tear gas inhalation while others sustained bruises due to being beaten up by the Israeli soldiers. In the Gaza Strip, the border areas with Israeli witnessed protests against the ongoing and unjust Israeli closured against the Gaza population. During those protests, the Israeli forces used forces against the protesters. as a result, a child was wounded, east of Jabalia in the northern Gaza Strip. In the Gaza Strip, as part of targeting fishermen in the sea, PCHR monitored the Israeli naval forces’ escalation against fishermen in the Gaza Sea although it was announced that the Gaza fishermen are allowed to sail to 9 nautical miles instead of 6. This proves that the Israeli forces continue their policy of targeting fishermen in their livelihoods. During the reporting period, Israeli gunboats chased fishing boats and opened fire at them 3 times; 1 of them in the north-western Beit Lahia and the others in the western Soudaniyah area, west of Jabalia in the northern Gaza Strip. During the reporting period, Israeli forces conducted at least 68 military incursions into Palestinian communities in the West Bank while they conducted 5 incursions into Jerusalem and its suburbs. During those incursions, Israeli forces arrested at least 32 Palestinian civilians, including 6 children and 2 women, in the West Bank. Four of them, including a woman, were arrested when Israeli settlers attacked Palestinian farmers and shepherds in Kherbet Um Hanitah, east of Yata, and the Israeli forces intervened to protect the settlers. Meanwhile, 12 civilians, including 6 children, were arrested in Jerusalem and its suburbs. As part of the house demolitions, on 23 November 2017, Israeli Municipality bulldozers demolished a house belonging to the family of ‘Issam al-Rajabi in al-Ashaqriyah neighbourhood in Beit Hanina, north of occupied East Jerusalem, rendering its residents homeless during the cold and rainy weather. The above-mentioned civilian said that he built his house in 2010 on an area of 140 square meters, and the Israeli Municipality fined him with 20,000 shekels in instalments. He paid 43 instalments but there are 7 instalments left. During this year, he added a 30-square-meter structure to the house, but the Municipality notified him that they will demolish it. On the abovementioned date, the house sheltering a family of 10 members along with the additional structures was demolished. On 25 November 2017, Israeli forces forced Jamal Abu Teir from Um Touba, southeast of occupied East Jerusalem, to self-demolish his house, upon a decision by the Israeli Municipality. Abu Teir said that he self-demolished his house after evacuating it to avoid paying the very high demolition expenses for the municipality. The house was built on an area of 40 square meters and used to shelter a family of 5 members. As part of the strangulation policy against the residents of Beit Xa village, northwest of occupied Jerusalem, the Israeli forces confiscated 8 vehicles belonging to civilians from the village. Eyewitnesses said that the Israeli forces aimed at confining the besieged village residents and restricting their movement. They added that the Israeli forces stationed at the sole entrance to the village spare no effort to maltreat the residents, particularly young men, while crossing the checkpoint. The Israeli forces have recently prevented the entry of construction materials and fuels, particularly cooking gas, into the village except in coordination with the civil administration. As part of the demolition of houses and other civil facilities, on 27 November 2017, Israeli forces demolished a barrack built of tin plates in Beit ‘Aynoun area, east of Hebron. The 120-square-meter barrack belongs to Mohammed Meswadeh (45) under the retext of builing without a license and is used for ferrous metals. As part of the Israeli settlers’ attacks against Palestinian civilians and their property, on 28 November 2017, Israeli settlers from “Mtsa Ya’ir” and “Yitir” settlements attacked Palestinian farmers and shepherds from Kherbet Um Hanitah adjacent to Mneizel village to the east of Yata, south of Hebron, while the latter were grazing their sheep and ploughing their lands to plant winter crops. The settlers attacked them with stones, batons and hands and when the farmers and shepherds tried to defend themselves, the Israeli soldiers attacked them without stopping the settlers and moving them away. The Israeli soldiers then arrested 4 civilians, including a mother of 5 children. At approximately 01:30, Israeli forces moved into Qabatiyah village, southeast of Jenin. They raided and searched a house belonging to Mohammed Saleh Saba’nah (22) and then arrested him. At approximately 02:00, Israeli forces moved into al-Yamoun village, west of Jenin. They raided and searched 2 houses belonging to Ahmed Mahmoud Abu ‘Obaid (24) and Ahmed ‘Ali Khamaisah (22) and then arrested them. At approximately 02:30, Israeli forces moved into Hebron and stationed at the residential neighbourhood, which is adjacent to Hebron University. They raided and searched 2 houses belonging to Mo’men Ayoub al-Qawasmah (24) and ‘Aadel Barakat Gheith (23) and then arrested them. At approximately 03:00, Israeli forces moved into al-Khader village, south of Bethlehem. They raided and searched a house belonging to Yusuf Omer Dawoud Salah. They arrested Yusuf’s mother to force him to turn himself in and then withdrew from the village. After 4 hours, the Israeli forces moved again into al-Khader village and arrested Yusuf Salah. At approximately 03:40, Israeli forces moved into al-Jalazoun refugee camp, north of Ramallah. They raided and a house belonging to Sa’id ‘Awad Nakhlah (27) and then arrested him. At approximately 15:00, Israeli forces accompanied with 2 military vehicles moved into Beit Ummer village, north of Hebron and stationed in Muthalath Safa area, east of the village. The soldiers deployed the area, stopped a number of vehicles and checked ID cards of the passengers. Meanwhile, a number of youngsters gathered in the vicinity of the area and threw stones at the Israeli soldiers. The soldiers immediately fired sound bombs and tear gas canisters at the youngsters and the road. As a result, the traffic was hindered due to the tear gas canisters fired by the Israeli soldiers. Later, the Israeli forces withdrew, and neither arrests nor house raids were reported. However, a number of civilians suffered tear gas inhalation. Note: During the aforementioned day, Israeli forces conducted (8) incursions in the following areas and no arrests were reported: al-Fawar refugee camp, Sa’ir and Shuyoukh al-‘Aroub villages in Hebron; Beit Led village, east of Tulkarm; Kafer Sour village, south of the city; Safarin village, southeast of the city; Qalqiliyah and ‘Azzoun village, east of the city. At approximately 01:30, Israeli forces accompanied with 4 military vehicles moved into Beit Ummer village, north of Hebron and stationed in al-Tahta neighborhood. They raided and searched 2 houses belonging to 2 brothers; Eyad and Bassam Khalil al-Za’aqiq. The Israeli forces withdrew from the 2 houses and no arrests were reported. At approximately 02:30, Israeli forces moved into Beit Rima village, northwest of Ramallah. They raided and searched several houses and then handed summonses to Ahmed Tareq al-Remawi (22) and Ibrahim Sadeq al-Remawi (24) to refer to the Israeli Intelligence Service on Thursday, 30 November 2017, in “Ofer” prison established on Betunia village, west of the city. At approximately 20:00, Israeli forces moved into Romanah village, west of Jenin. They patrolled the streets and then arrested Ahmed Walid Ahmed Abu Baker (25) while he was on his way to the grocery shop. Note: During the aforementioned day, Israeli forces conducted (5) incursions in the following areas and no arrests were reported: Yatta, Surif, Ethna and Kerbat al-Semiya in Hebron; and Joyous village, northeast of Qalqiliyah. At approximately 09:50, Israeli gunboats stationed offshore, northwest of Beit Lahia village in the northern Gaza Strip, opened fire at Palestinian fishing boats sailing within 3 nautical miles and chased them. As a result, the fishermen were forced to flee fearing for their lives, but neither casualties nor material damage was reported. Note: During the aforementioned day, Israeli forces conducted (8) incursions in the following areas and no arrests were reported: Beit Led village, east of Tulkarm; Hablah village, south of Qalqiliyah; Joyous village, northeast of the city; Bedia village, west of Salfit; Beit Kahel, al-Thaheriyah, al-Hadab villages, and Yatta in Hebron. At approximately 01:55, Israeli gunboats stationed off al-Sudaniyah shore, west of Jabalia in the northern Gaza Strip, opened fire at Palestinian fishing boats sailing within 5 nautical miles and chased them. As a result, the fishermen were forced to flee fearing for their lives, but neither casualties nor material damage was reported. At approximately 02:30, Israeli forces moved into al-Khader village, south of Bethlehem. They raided and searched a number of houses after which they arrested 3 civilians namely Mohammed (25), his brother Mahmoud Ibrahim Da’dou’ (19), and Mohammed Khader Abu ‘Amous (17). Note: During the aforementioned day, Israeli forces conducted (15) incursions in the following areas and no arrests were reported: Nablus and Tal village, southwest of the city; ‘Azzoun village, east of Qalqiliyah; Tulkarm, Shuweikah Suburb; ‘Enabta village, and Noor Shams refugee camp , east of the village; Baqa eastern village, north of the city; the villages of Nazlet ‘Essa, Nazlet Abu al-Nar, al-Nazlah al-Sharqiyah, al-Nazlah al-Gharbiyah, and al-Nazlah al-Wusta, northeast of the city; Dura and Hebron. At approximately 01:00, Israeli forces moved into al-Jalamah village, northeast of Jenin. They raided and searched 2 houses belonging to Ahmed Nidal Abu Farhah (22) and Mahmoud Omer Abu Farhah (26) and then arrested them. At approximately 02:00, Israeli force moved into Madama village, south of Nablus. They raided and searched a house belonging to Ahmed ‘Aayed Qet (23) and then arrested him. Around the same time, Israeli forces moved into ‘Ourta village, southeast of Nablus. They raided and searched a house belonging to Abdul Hafith Ramzi ‘Awad (16) and then arrested him. Dura, southwest of Hebron. They raided and searched a house belonging to Nabil Mohammed Masalmah (45) and the arrested him. At approximately 02:30, Israeli forces moved into Hebron and stationed in al-Salam neighborhood. They raided and searched a house belonging to Diya’a Salman Sarahnah (23) and then arrested him. Around the same time, Israeli forces moved into Tulkarm. They raided and searched a house belonging to Mohammed Yusuf al-Bari (20) and then arrested him. At approximately 03:00, Israeli forces moved into al-Khader village, south of Bethlehem. They raided and searched a number of houses after which they arrested 4 civilians, including 2 brothers, namely Mohammed (15), Ahmed Mahmoud Saleh Mousa (13), Mohammed Sa’oud Sbaih (15) and Abdul Rahim al-Masri (13). At approximately 03:30, Israeli forces moved into Karisah village, east of Dura, southwest of Hebron and stationed in Khelat Jobran area. They raided and searched 2 houses belonging to Rezeq Musalam al-Rjoub (55) and his son Ahmed (26) and then arrested them. The soldiers also confiscated Rezeq’s car. Note: During the aforementioned day, Israeli forces conducted (7) incursions in the following areas and no arrests were reported: Beit Ummer, Taffouh, and al-Majd villages in Hebron; ‘Azzoun, al-Nabi Elias villages and Tulkarm, east of Qalqiliyah. At approximately 01:30, Israeli forces moved into Salfit. They raided and searched a house belonging to Anas Wasef al-Zeir (28), who holds a Ph. D, and then arrested him. Around the same time, Israeli forces moved into Qarawet Bani Hassan village, northwest of Salfit. They raided and searched a house belonging to Adam Rashad Mar’i (24), who holds a Ph. D, and then arrested him. At approximately 03:00, Israeli forces moved into Barqin village, southwest of Jenin. They raided and searched a house belonging to Ahmed Abdul Hadi ‘Atiq (33) and then arrested him. At approximately 04:00, Israeli forces moved into Beit Fajjar village, south of Bethlehem. They raided and searched a number of houses and then handed summonses to Mohammed Akram Taqatqa (23) and Emad Ibrahim Deriyah (25) to refer to the Israeli Intelligence Service in “Gush Etzion”, south of the city. Note: During the aforementioned day, Israeli forces conducted (3) incursions in the following areas and no arrests were reported: Yatta, al-Burj and Howarah villages, south of Nablus. Following Friday Prayer on 24 November 2017, dozens of Palestinian civilians, international human rights defenders and Israelis organized protests in Ni’lin village, west of Ramallah, in protest against the annexation wall and settlement activities. Israeli forces forcibly dispersed the protests, firing live and metal bullets, tear gas canisters and sound bombs. As a result, an International protester holding the German passport sustained a metal bullet wound to the right side of his back. He received medical treatment on the spot by the ambulance crews that were in the area. Following the same Friday prayer, dozens of Palestinian civilians, international human rights defenders and Israelis organized protests in Bil’in villages, west of Ramallah, al-Nabi Saleh village, northwest of the city, and Kafer Qadoum village, northeast of Qalqiliyah, in protest against the annexation wall and settlement activities. Israeli forces forcibly dispersed the protests, firing live and metal bullets, tear gas canisters and sound bombs. They also chased the protesters into the olive fields and between houses. As a result, many of the protesters suffered tear gas inhalation while others sustained bruises due to being beaten up by the Israeli soldiers. Following the same Friday prayer, dozens of Palestinians from Kherbet Qalqas, east of Hebron organized a protest at the southern entrance to the village, which has been closed by the Israeli forces for 17 years, restricting the movement of the village residents. Large force of Israeli soldiers arrived at the area. When civilians attempted to move towards the sand barriers which close the road while raising the Palestinian flags and banners, the Israeli soldiers threatened to fire tear gas canisters at them. It should be noted that the Israeli authorities informed the Hebron Municipality their approval to open the road. After opening the road for 14 days, an Israeli force accompanied with a bulldozer arrived at the area and closed the road again. At approximately 08:00 on Sunday, 26 November 2017, dozens of Palestinian students organized a protest in al-‘Aroub refugee camp, north of Hebron, on the second anniversary of murdering Khalid al-Jawabrah near the bypass road in the vicinity of the refugee camp. A number of students gathered near the UNRWA distribution center, while a number of them headed to the street leading the camp where there were several Israeli patrols stationed in the area. The students threw stones at the soldiers, who stepped off their military vehicles. The soldiers then moved towards the camp and sporadically fired sound bombs and tear gas canisters at the students and houses. As a result, a number of students suffered tear gas inhalation. Later, a number of soldiers topped several house roofs in the neighborhood and sporadically fired lived bullets at the stone-throwers and civilians, who were on the street. As a result, Ahmed Mohammed Abdullah Abu Dayyah (22) sustained shrapnel wound to the right thigh and was transferred via a civilian car to a medical complex in Beit Fajjar, which is about 1.5 kilometers away from the abovementioned camp. Ahmed received first aid at one of the private clinics. Following that, Ahmed was transferred via an ambulance of the Palestine Red Crescent Society (PRCS) to a hospital in Bethlehem. When the ambulance arrived at “Gush Etzion” intersection, the Israeli soldiers stopped it, arrested Ahmed and took him to “Shaare Zedek” Medical Centre, where he received medical treatment. Ahmed was released at approximately 22:00 in front of the camp. In a separate incident, Israeli forces fired live bullets at a 16-year-old child when he was near a bakery. As a result, the child sustained shrapnel wounds to the lower part of his body and was transferred to Hebron Government Hospital. 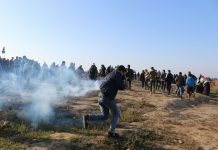 At approximately 13:30 on the same Friday, 24 November 2017, dozens of Palestinian youngsters made their way to the border fence between the Gaza Strip and Israel, east of al-Shuhada’a Cemetery, east of Jabalia in the northern Gaza Strip, in protest against the Israeli closure imposed on the Gaza Strip. The youngsters approached the security fence and threw stones at the Israeli soldiers along the border fence. The soldiers fired live bullets, rubber-coated metal bullets, and tear gas canisters at the protestors. As a result, a 16-year-old child from al-Remal neighborhood was hit with a tear gas canister to the right leg. He was transferred by a PRCS ambulance to the Indonesian Hospital. His injury was classified as minor. PCHR apologizes for not publishing the table of the Movement at Karm Abu Salem Crossing and will publish it in the weekly report next week. On Wednesday, 22 November 2017, the Israeli authorities allowed 3 persons to give testimony before the Israeli courts. On Thursday, 23 November 2017, the Israeli authorities allowed 2 persons, who work at the General Authority of Civil Affairs (GACA) and internationals to renew their permits. On Wednesday, 22 November 2017, the Israeli authorities allowed 5 persons; on Thursday, 23 November 2017, 4 persons; on Sunday, 26 November 2017, 4 persons; and on Monday, 27 November 2017, one person to return to the West Bank. Ramallah: Israeli forces established (4) checkpoints all over the city. On Friday, 24 November 2017, Israeli forces established 4 checkpoints at the entrances to al-Nabi Saleh, Ni’lin, Kherbitha al-Mosbah, and ‘Atara villages. On Thursday, 23 November 2017, Israeli forces established 4 checkpoints at eastern entrance to Dura village, at the entrance to Shayyoukh village, at the southern entrance to Halhoul village, and at the entrance to Ethna village. On Friday, 24 November 2017, 2 similar checkpoints were established at the northern entrance to Yatta village and at the southern entrance to Hebron. On Saturday, 25 November 2017, Israeli forces established 2 checkpoints at the entrances to Ethna and Sa’ir villages. On Sunday, 26 November 2017, Israeli forces established 3 checkpoints at the entrances to al-Fawar and al-‘Aroub refugee camps and at the entrance to Bani Na’iem village. On Monday, 27 November 2017, Israeli forces established 2 checkpoints at the entrance to Yatta village and at the entrance to al-‘Aroub refugee camp. On Tuesday, 28 November 2017, 4 similar checkpoints were established at the entrances to Samou’a and Karmah villages, at the entrance to al-Fawar refugee camp, and at the entrance to ‘Abdo road. Qalqiliyia: Israeli forces established (13) checkpoints all over the city. On Thursday, 23 November 2017, Israeli forces established 3 checkpoints at the entrances to ‘Azoun , al-Nabi Saleh, and Hiblah villages, south of the city. On Friday, 24 November 2017, Israeli forces established 4 checkpoint at the eastern entrance to Qalqiliyia (was established twice); at the entrance to Hiblah village, south of the city; and between ‘Azoun and Kafur al-Thulth villages, east of the city. At approximately 15:15 on Saturday, 26 November 2017, Israeli forces established 5 checkpoints at the eastern entrance to Qalqiliyia; at the southern entrance to Hiblah village (was established twice); at the entrance to ‘Azoun village, east of the city; and at the entrance to Kafur al-Thulth village, east of the city. At approximately 15:15 on Saturday, 25 November 2017, Israeli forces established 5 checkpoints at the eastern entrance to Qalqiliyia, at the southern entrance to Hiblah village (was established twice), at the entrance to ‘Azoun village, and at the entrance to Kafur al-Thulth village, east of the city. At approximately 17:30 on Monday, 27 November 2017, Israeli forces established a checkpoint at the entrance to ‘Azoun village, east of Qalqiliyia. On Saturday, 25 November 2017, Israeli forces established a checkpoint at the entrance to Dirsitiyia village, northwest of Salfit. On Monday, 27 November 2017, Israeli forces established 3 checkpoints at the entrances to Kaful Hares village, north of Salfit; and at the entrances to Hares and Dersitiyia villages, northwest of the city. At approximately 15:30 on Thursday, 23 November 2017, Israeli forces tightened its measures at ‘Inab checkpoint, east of Tulkarm. They obstructed the civilians’ movement until 17:30. The checkpoint was removed later and no arrests among civilians were reported. At approximately 18:10 on Friday, 24 November 2017, Israeli forces tightened its measures again at the ‘Inab checkpoint. At approximately 01:00 on Thursday, 23 November 2017, Israeli forces stationed at a checkpoint established at the entrance to al-Salimah neighborhood in Hebron’s Old City, arrested Moahmed Amar Da’nah (10), from al-Hariqah neighborhood. He was then taken to “Ja’baraj” Police Station under the pretext of throwing stones. Mohamed was later released. At approximately 09:20 on Saturday, 25 November 2017, Israeli forces established a checkpoint near ‘Atara village’s bridge, north of Ramallah. They stopped Palestinian civilians’ vehicles and checked the passengers’ IDs. In the meantime, they arrested Rami Ahmed ‘Asfour (25), from Ramallah, while crossing the checkpoint, heading to his cousin in Rawabi City. At approximately 09:00 on Monday, 27 November 2017, Israeli forces stationed at a military checkpoint, east of al-Ibrahimi Mosque, arrested Mo’tasem Naser Abu Rimilah (16), claiming that he had a knife. At approximately 14:00 on Monday, 27 November 2017, Israeli forces established a checkpoint at the intersection of Jabi’ village, south of Jenin. They stopped Palestinian civilians’ vehicles and checked the passengers’ IDs. In the meantime, they arrested ‘Atallah Mohamed ‘Attallah Hashash (45), from Balata refugee camp, east of Nablus. At approximately 16:00 on Monday, Israeli forces established a checkpoint on Ramallah-Nablus Road, near al-Laban village, south of Nablus. They stopped Palestinian civilians’ vehicles and checked the passengers’ IDs. In the meantime, they arrested Diyaa Sameeh Mohamed Abu ‘Arab (25), from Balatah refugee camp, east of Nablus. At approximately 00:00 on Thursday, 23 November 2017, Israeli forces moved into Silwan village, south of occupied East Jerusalem, and indiscriminately fired sound bombs. They then raided and searched houses from which they arrested Khaled Samer Adkidek (10) and Rammah Abed al-Hadi ‘Odah (25). At approximately 01:00 on Friday, 24 November 2017, Israeli forces moved into Silwan village, south of occupied East Jerusalem. They then raided and searched a house belonging to Qusi Husam Zaytoun (13) and arrested him. On Saturday, 25 November 2017, Israeli forces arrested Mohamed ‘Adel Soweity (13), from Silwan village, south of occupied East Jerusalem. Mohammed surrendered to al-Qashla Police Center after the Israeli forces summoned him in the previous day. At approximately 02:000 on Monday, 27 November 2017, Israeli forces moved into Abu Tayieh neighborhood in Silwan village, south of occupied East Jerusalem. They then raided and searched a house belonging to ‘Arafat Abu al-Hamam (45) and arrested him along with his sons Mohamed (19) and Shadi (21). They also arrested ‘Arafat’s brother, ‘Amir (37). ‘Arafat’s wife, Shereen Abu Hamam, said that the Israeli forces raided their house and arrested her husband, two sons, and brother-in-law after severely beating them up. She added that the Israeli forces locked her in the balcony and denied her access to the house. During which, Shereen heard her detained sons shouting in the house. When the Israeli forces withdrew from the house and arrested her husband and sons, Shereen found blood on the wall. In the same context, Israeli forces moved into al-A’awar neighborhood in Silwan village. They raided and searched a house belonging to ‘Abed al-Men’im al-A’awar (19) and arrested him after beating him up. On Monday, Israeli forces seized 8 Palestinian vehicles from Beit Xa village, west of occupied East Jerusalem. Eyewitnesses said that the Israeli forces stationed at the checkpoint established at the entrance to the village seized 8 vehicles belonging to the village residents. The eyewitnesses also said that the Israeli forces aim at confining the village residents and obstructing their movement. They also added that the Israeli forces spare no effort to maltreat the Palestinian civilians while crossing the checkpoint, especially young men. Lately, the Israeli forces prevented the entry of construction materials and fuels, especially cooking gas, to the village, except in coordination with the Israeli Civil Administration, but the residents reused so. It should be noted that the Israeli authorities seized most of Beit Xa village lands, which are about 10 thousands dumuns, and around 360 dumuns are left. The Israeli forces also prevent paving the village main street under flimsy pretexts. At approximately 01:00 on Tuesday, 28 November 2017, Israeli forces moved into al-Tour neighborhood, east of occupied East Jerusalem. They raided and searched houses from which they arrested Sari Sami Abu al-Hawa (14), Na’iem Ibrahim ‘Ashayier (11), and Mahmoud Mohamed al-Hidrah (13). At approximately 17:00 on Thursday, 23 November 2017, Israeli Municipality bulldozers demolished a house belonging to al-Rajabi family in al-Ashqariyia neighborhood in Beit Huninah, north of occupied East Jerusalem. They expelled the house residents during the cold and rainy weather. 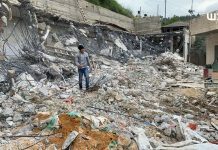 ‘Esam al-Rajabi (43), the house owner, said that the Israeli bulldozers, under the Israeli police’s protection, raided his house in al-Ashqariyia neighborhood and demolished it under the pretext of non-licensing. He also said that the Israeli forces ordered him and his family to get out of the house and did not allow them to vacate the house contents. 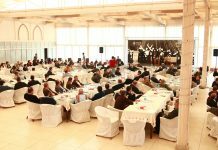 Al-Rajabi said the Israeli District Court in Jerusalem held a session on 08 November 2017, in order to extend the demolition decision, but the court rejected the lawyer’s demand. Few days later, the lawyer headed to the Jerusalem Municipality Court to obtain an order to stop the demolition, but he did not get any response. ‘Esam also said that a police officer in al-Nabi Ya’qoub Police Station in Beit Haninah contacted him yesterday informing him that the house will be demolished next week. As a result, the lawyer submitted an appeal to the Israeli Supreme Court. Al-Rajabi pointed out that the Israeli District Court’s decision, which was issued at the beginning of this month, ordered to demolish a 30-square-meter structure added to the old house. He also said that he was surprised with the Israeli Municipality bulldozers demolishing the 140-square-meter house. Although he objected to the demolition of the old house, the Israeli Municipality officers insisted on demolishing the whole house. ‘Esam said that he built the house in 2010, and the Israeli Municipality imposed a construction fine on him of NIS 20,000 in installments. He paid 43 installments while there are still 7 payments left. He had to add a 30-square-meter structure to his old house 5 years ago for his son Kamel, who wanted to get married. ‘Esam applied for a license few years ago, but the Jerusalem Municipality did not respond. The abovementioned house used to shelter 10 persons and was comprised of 4 rooms, kitchen, bathroom, and 2 other rooms for Kamal. On Saturday, 25 November 2017, Israeli forces ordered Jamal Omar Abu Tair to self-demolish his house in Um Tuba village, southeast of occupied East Jerusalem, under the pretext of non-licensing. Jamal said that he self-demolished his house after vacating it to avoid paying costly municipality demolition fees. He also said that his 40-square-meter house was comprised of 2 rooms, kitchen, and bathroom, and sheltering 5 persons. At approximately 09:00 on Monday, 27 November 2017, Israeli forces accompanied with military vehicles, a vehicle of the Israeli Civil Administration, and a bulldozer moved into Beit ‘Aynoun area, east of Hebron. They then stationed on the road leading to Biet ‘Aynoun area. The bulldozer demolished a 120-square-meter barrack belonging to Mohamed Suliman Zakaria Moswada (45) and built of tin plates. The barrack was used for ferrous metals and demolished under the pretext of non-licensing. At approximately 10:00 on Tuesday, 28 November 2017, a group of Israeli settlers from “Mitzpe Yair” and “Yatir” settlements, attacked Palestinian farmers from Kherbit Um Hunitah adjacent to Manizel village, east of Yatta, south of Hebron. The Palestinian farmers were breeding their livestock and ploughing their lands. The Israeli settlers threw stones at the farmers and beat them with batons. When the framers attempted to defend themselves, the Israeli forces attacked them as well without taking the settlers away from the area. After that, a large force of Israeli soldiers arrived at the area and declared it as a closed military zone. They then arrested Hanan Mousa Ali Harizat (37), Karam Mohamed Harizat (20), Saleh Ahmed Mohamed Harizat (21), and Ali Mohamed Harizat (21). Moreover, ‘Emad Irsheed, the Manizel School’s cleaner, and ‘Aziza Salem Harizat (45), were detained, claiming that they took photos without get a permit. The arrested persons were taken to an investigation center in “Karyit ‘Aba’” settlement, east of Hebron. The arrested persons were released few hours later.